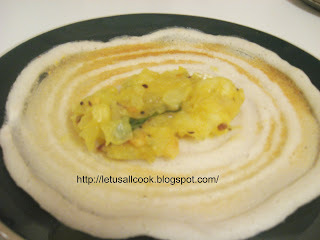 Dosa, a very famous South Indian recipe, can be served for breakfast or for Dinner. Mostly, it is preferred during breakfast, but in some houses like us, we eat tiffen for dinner and hence these dosas become part of dinner too. Most of the Non-Indians, to my knowledge, are aware of this recipe, but still there are a few who are new to this dosa. There are many variations of dosa. At this time I must say about the Dosa mela hosted by my dear Srivalli. Here you can find humongous varieties of Dosa and how they are made. The Basic method of preparing Dosa is the same but with slight variations, we can do wonders with this recipe. To make Dosa all you need is the Dosa batter. This is really easy to prepare. 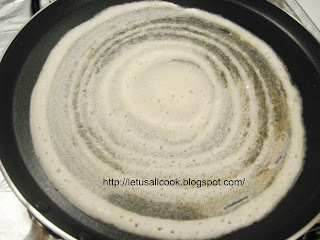 I will write a detailed post on preparing Dosa and Idly batter soon. But for now, you just need to know that for this dosa, the batter is prepared by soaking 3 cups of Rice and 1/2 cup of Urad dal and grinding them and allowing them to ferment overnight. In a pan, add the oil and allow the mustard seeds to splutter. Then add hing and cumin seeds. Add urad and channa dal and saute them. Now add the onions and saute them. Add the green chillies, fried cashew and garlic and saute them. Add chilli powder,salt, turmeric powder and mix well. Add little water so that these spices are not burned. Add the mashed potatoes and mix well. Garnish it with cilantro. Add 1 tsp of lime juice, mix and switch off the stove. Prepare the dosa by taking small amount of the batter and spread it in the Tawa/grill in a circular shape (or your favourite shape) and cook it with few drops of oil or ghee until golden brown. Place this masal inside the dosa, fold it and serve hot with chutney or sambhar. Here it is the lovely Masal Dosa ready to eat! 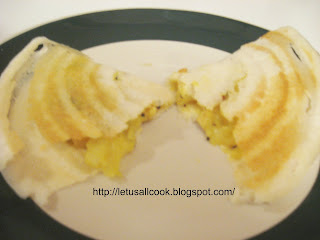 im very bad in dosa mkin,.ur looks deliciousmd niceclick too,.thnks forshrin,..
oh yum!! an all time favourite of mine!! :-) mouth-watering pics, sangeeth!! looks nice..am planning to make dosa today!!! Dosa is one thing I can NEVER get right! Love your version. masala dosa my all time favourite.